We just enjoyed a trip to visit the gorgeous Kingsbarns Distillery Visitor Centre near St Andrews in Fife this week. 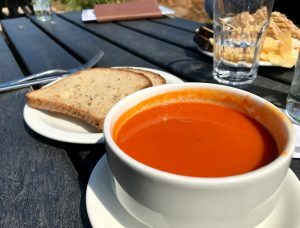 Of particular note is the great cafe which has a range of gluten free items including THREE types of cake, plus sandwiches, soups and snacks. The visitor centre itself is beautifully created and is a great place to visit to learn about the local whisky, to try some of the delicious Darnley’s Gin (which is why we were there) or just to enjoy this great little cafe. I had a very good pepper, tomato and chilli soup with some tasty GF bread, then we felt that in the interests of this website, we should try the three GF cakes on offer. There was a huge piece of carrot cake, a salted caramel brownie and some millionaire shortbread. The coffee is great too! For a quick summation (but really so I can re-live how much I enjoyed these cakes) the carrot cake was seriously moist and nicely spiced. The icing was not overly sweet, which some carrot cake icing can be. 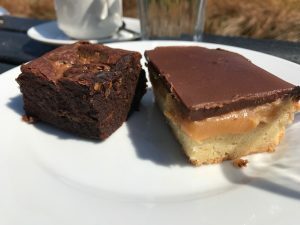 The salted caramel brownie was dense and delicious and the millionaire shortbread was just oozing its toffee and had a good chocolate top and moist biscuit base. Any one of these three is worth a trip from Edinburgh to Kingsbarns! The visitor centre is also available to book for a private dinner or there is a new experience on the way in which you can distill your own gin. Yes please!